Years ago, I managed a provincial Eating Disorder Awareness Week campaign themed, “Fitness or Fat Phobia?” I had long been concerned with the growing numbers of athletes – amateur, varsity and professional – who had been contacting the Eating Disorder Resource Centre of British Columbia with concerns of disordered eating, over exercise and/or body dysmorphia. In the years leading up to this campaign, I had made several attempts to reach out to coaches, but I was most often met with denial that there were any such issues within their particular sport or among their athletes. By the time we launched this particular campaign, there had been a shift in awareness and I was approached to speak to a provincial organization of coaches. Coaches had become more aware of the potentially serious consequences of eating disorders and were more familiar with some of the more overt symptoms. Moreover, many of the coaches were lost as to what to do, and they realized that they and their athletes needed help and guidance. According to a Norwegian study cited on the National Eating Disorder Information Centre’s (NEDIC) website, elite athletes demonstrate significantly higher rates of eating disorders compared to population controls. In one study, 20% of elite female athletes met the criteria for having an eating disorder, compared to 9% of female controls. In men, 8% of elite male athletes met the criteria for having an eating disorder, compared to 0.5% of male controls. Female athletes competing in aesthetic sports (e.g. dance, gymnastics and figure skating) were found to be at the highest risk for eating disorders. Athletes competing in weight-class and endurance sports were also at elevated risk for eating disorders (2004, Sungot-Borgen, J. & Torstveit, M.K. Prevalence of Eating Disorders in Elite Athletes is Higher Than in the General Population. Clinical Journal of Sport Medicine, 14,1, pp 25-32). In a study of Division 1 NCAA athletes (highest level of varsity athletes in the US), over one-third of female athletes reported attitudes and symptoms placing them at risk for anorexia nervosa. Although most athletes with eating disorders are female, male athletes are also at risk, particularly those competing in sports that tend to place an emphasis on the athlete’s diet, appearance, size and weight requirements, such as wrestling, bodybuilding, crew, and running (NEDA, 2015). While these studies highlight the increased risk in certain sports for females and males to develop eating disorders, and these statistics reflect my own clinical experience with regard to higher risk, it is important to emphasize that eating disorders exist in a far wider range of individual and team sports. A few years ago, NEDIC’s conference included a workshop on eating disorders among varsity athletes. The four coaches on the panel shared their experiences and concerns regarding eating disorders among their athletes, one in fact begging for forgiveness to any of her former athletes for her prior approach that had included routine measuring of her female athletes’ body fat, a measure that she no longer believed made any significant difference to their performance, and had since recognized that such testing often caused unnecessary anxiety and potential harm to her athletes. In retrospect, she speculated as to how many might have engaged in unhealthy dieting and eating disorder behaviours to lower their percentage of fat. Another spoke of her focus on good nutrition, proportion and strength as well as discussed female athletes’ uniforms, pointing out that her team wore shorts and waist length singlets in contrast to the more revealing and body focussed bikini bottoms of comparable university teams in the US. One coach spoke about his men’s football team and how, until he had started to prepare his presentation for the conference, he had believed that none of his male athletes had disordered eating. However, after researching the subject, he revised his opinion such that he claimed that almost every one of his athletes likely struggled with some degree of disordered eating. He believed that steroid use was no longer an issue on his team, but he remained concerned about his athletes’ binge eating and enema use before games. There was one very experienced coach of a women’s varsity team who, despite having dropped skin fold testing (i.e., body fat) for several years, she had recently resumed the practice in her effort to help her athletes “not necessarily to lose weight” but to become fitter and to improve performance. Although she acknowledged that in the past she had had some athletes with eating disorders, she was confident that now she would absolutely know if any of “her girls” were struggling with such a problem. Like family members, partners and close friends who can’t imagine that their loved one would deceive them, coaches often underestimate the degree to which individuals may hide or lie about their eating disorder behaviours even if they may never have been deceitful about anything else. Coaches may not appreciate the depth of shame and secrecy – and the dependency as a means of coping with life’s transitions and day to day stresses – of athletes who struggle with eating disorders. Female athletes are at a particular risk of developing what is referred to as the “Female Athlete Triad”: disordered eating, amenorrhea (consecutive loss of menses) and osteoporosis (loss in bone density). All of these are serious and potentially life threatening medical concerns that can have long term consequences. Insufficient nutrition and loss of weight often results in amenorrhea, which in turn leads to calcium and bone loss, putting the female athlete at a much greater risk for stress fractures of the bones. 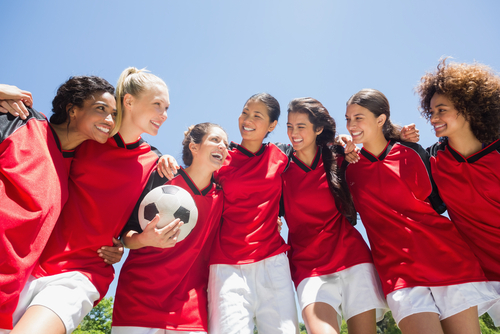 While this triad is worrisome for any female athlete (or any female, for that matter), the risk is far more significant for adolescents girls because of their growing bodies, combined with peer and social pressures, as well as rapid life transitions. Over the course of my career in this field, I have worked with many competitive athletes struggling with eating disorders. As all of my clients would know, I am a firm believer that sport can potentially help participants: to increase his or her level of health, to improve body image, to improve self-esteem, to increase a sense of belonging, to develop a better understanding of food as critical fuel, to increase bone density, and to prevent or better cope with stress, anxiety and depression. However, sometimes things get off track, particularly if an athlete is predisposed genetically, is in an environment that emphasizes weight and shape over health and performance, and/or is struggling to cope with the combined pressures of life, sport and academia (or a career). The athletes I work with are almost always afraid that recovery from their eating disorder will translate to a decrease in athletic performance. And what has surprised every athlete that I have worked with is their eventual realization that improved nutrition, strategic training, increased energy, better concentration and emotional stability most often increase their performance and competitive edge, not to mention improve their relationships with their fellow athletes and coaches. All in all, a win win result. Coaches who focus primarily on success and performance rather than on the athlete as a whole person (NEDA, 2015). How did you get started in this field? I want to be a dietitian who specializes in eating disorders but I don’t know how to specialize in that field I can’t find much research on it. I have advised many individuals hoping to embark on a career related to eating disorders. A good start would be to talk to working dietitians to find out more about the academic requirements, the field in general, and the opportunities.I would suggest including at least one dietitian who works in the field of eating disorders (i.e., all eating disorder programmes would have at least one dietitian on staff). Eating disorders can attack anyone. No one is really protected from it. Athletes can have eating disorder too. The illness may affect their performance in the sport they are in. It is often through recovery from disordered eating that athletes (and non-athletes) become more aware as to how much their performance and physical, cognitive and emotional functioning had been affected. ©2015 Cynthia Johnston. All Rights Reserved.